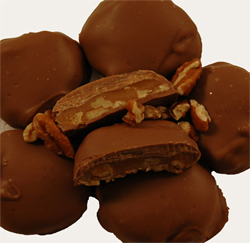 Our "Paw Prints" in their classic version are chews featuring pecans topped with caramel and then topped with a dollop of our luscious chocolate. This confection is a favorite with long-time Dorothy's customers. From Carol of McKees Rocks, Pennsylvania on 3/6/2012 . From Patman412 of Pittsburgh , Pennsylvania on 1/16/2012 . From Anonymous of California, Pennsylvania on 12/26/2011 .